All The Work For You"
Here is your chance to make your salesletter boost more sales by making it look more professional without paying hundreds of dollars every time you need an image! If you want a highly converting sales letter, it's a known fact that it converts well if it has professional-looking graphics to go with it. A costumer's urge to buy your product is based on the visual impact your sales letter makes. And with this, you can either hire a professional grpahics desgier to do all the graphics for you, which may cost you $97 and above every time you need one, or do it all yourself. If you are starting out or are short in cash this is a no-no for you, which can hurt your sales even more because you do not have the graphics to boost your sales. So what are you to do if you want high quality graphics without having to pay a graphic designer? Well, today my friend, I have good news for you, because today you can save yourself hundreds of dollars on professional graphics because you will have all the salesletter graphics you need to have a profit pulling sales letter to help your online business! 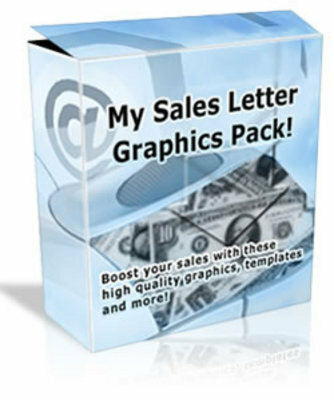 Introducing My Sales Letter Graphics Pack! My Sales Letter Graphics Pack is everything you need to create a profit-pulling sales letter with professionally-made graphics without spending hundreds of dollars on a graphic designer to do the same graphics for you. If you are low in cash, you can try any of these 5 sales business headers and 4 niche headers in this set. Each comes in blank .jpg and .psd formats so you can edit them in Photoshop or in any other graphics software and put your own text on them. You can make your sales letter prettier by adding any of these order or buy now buttons which are all easy to edit. There are over 100 of them here, which come in different colors, so you'll be sure you can have one you like. They all come in .psd and .jpg formats so they can be customized in Photoshop or any other graphic software! Sometimes there are main points you'd like to point out in your sales letter, which you'd like your visitors to pay attention to. And what could be a better way to do that than to use any of these custom shapes! There are over 60 custom shapes in this set, which also come in different colors, so you will not run out of the ones to choose from! Many sales letters nowadays use texts that highlight some points or warning signs they want their visitors to remember. Now you can also use the same text by having these 30 texts and scribbles from this collection. Words such as "Warning! ", "Money Back Guarantee! ", "P.S." and more are all included in this set, which are all in .jpg format so they can be added to your sales letter easily. Want to make your sales letter more professional? Use any of these 12 money back guarantee seals, in .psd and .png files, so you can tell your customers that their payments are risk free since they will be refunded by you if they do not like your product! Offering a One Time Deal? How about a special offer? If you have something special to offer to your buyers you better tell them through any of our price stickers and signs in this collection. There are over 20 in this collection, in .psd and .jpg formats, so you will not run out of signs to use! Want your visitors to take note of the main benefits of your product? Then use any of these 20 bullets which are specifically designed to catch your readers' attention and convert more sales! Now you won't have to make them from scratch because they are all ready to be added on your sales letter! If you want a visual representation for your product, an ezine or an ecourse, you can try any of these ecover templates, which are in book, CD case, and notebook forms. They can be easily editted through Photoshop or any graphic software, as they come in blank .jpg and .psd formats. Want to see samples of these images? Just go to this page! They are all in one page for easy viewing. And if you think this is just all you'll get, we have a bonus for you! So there you have it, all the things inside My Sales Letter Graphics Pack. And if you think you'll have to pay $147 or more just to get all these (since they are worth hundreds anyway), today you can take advantage of My Sales Letter Graphics Pack for only $7.99. If you want any of these images or graphics done for you each time it will cost you hundreds of dollars. Will you seriously pay a graphic designer to do any of these graphics for you when you have them all here? You could be saving yourself a serious amount of money if you take advantage of this offer. That's right. If you think your purchase is not a money-saver for you, you can say so within 30 days from the date of your purchase and we will gladly issue you a refund. That way you can have a peace of mind with your purchase, fair enough? So don't think about whether or not buying My Sales Letter Graphics Pack now; just click the order button below to buy now!